The Argonaut newspaper features our Los Angeles cooking classes. The Argonaut Newspaper serves Westside neighborhoods in Los Angeles. Patricia Rose travels the world through her Westchester cooking classes. That’s what the Argonaut newspaper wrote after interviewing me for the story in this week’s issue serving the local Westchester to Santa Monica audience in the Los Angeles area. Dishes with a dash of culture. To lighten up our meals after the holidays, our mission at this cooking class was to learn how to use some fresh authentic Asian ingredients that we purchased at the Asian Superstore. While we all eat Asian food at restaurants, seeing the raw ingredients and working with them was a new adventure. Pasta is one of the most versatile “food groups” as far as I’m concerned. You can add so many things to pasta and come up with a casual or an elegant meal. Today there are so many pasta options in our supermarkets – you can purchase whole wheat pasta, gluten free pasta made from rice (check out Lundberg.com) and semolina pasta in every possible shape and size. If you’ve never tasted fresh pasta, get ready for a surprise to your senses. In this class you will be cranking out fresh pasta by hand and see how the nonni’s of old created simple, but yet delicious dishes from the basics in their kitchen – flour and eggs ( flour paste – hence pasta). We will try a number of sauces too. 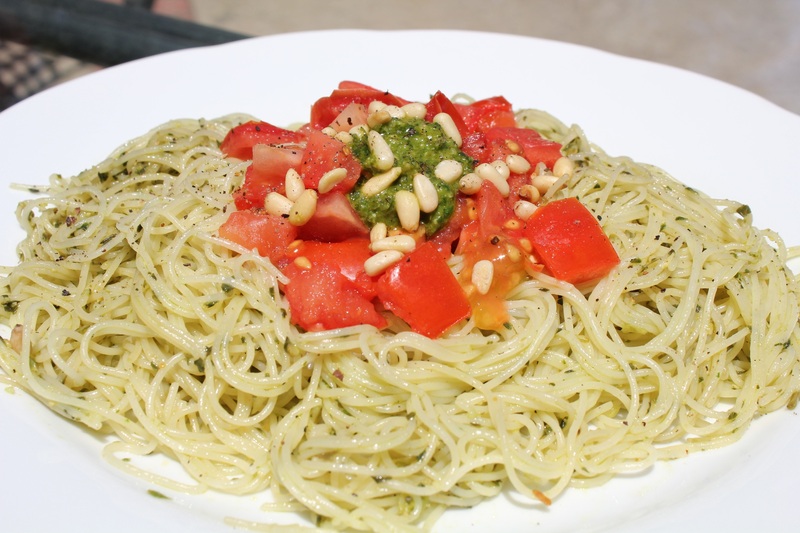 Pesto, browned butter and sage, a milk based sauce, sun-dried tomato – all with a different twist of course. Once we complete the cooking we will sit down and enjoy our meal with a glass of Chianti! Come join us on Thursday, June 9, 6:00 – 9:00! What cook doesn’t want to add new pasta dishes to his/her repertoire? Class fee $35 when you reserve by June 6, $40 at the door. To reserve your spot, email Patricia@FreshFoodinaFlash.com . Then write a check to “Fresh Food in a Flash”; mail it to Holy Nativity Episcopal Church, Cooking Class, 6700 West 83rd Street, Westchester, CA 90045. Enter your email address to get more Fresh Food in a Flash posts. I am a Chef, Cooking Teacher and Food Blogger. Learn how to create delicious and healthy food in a FLASH. Fig Balsamic Drizzle tops 15-minute Salmon.